Ace fashion designer and a hot topic in the world of glamour today, Sabyasachi Mukherjee celebrates 20 years of his brand today. From designing Deepika Padukone and Ranveer Singh's bridal trousseau to styling Oprah Winfrey for her Elle India photoshoot, Sabya with his talented mind has only gone places to achieve feats that were either tagged as impossible or unrealistic. He started his journey in a small workshop in Kolkata and today witnesses the most number of followers and eager minds who are drawn to his stunning collections. From conventional drapes to elegant wedding collections, he's the ruler of this ethnic world that becomes magical every time he decides to design and implement his vision. Isha Ambani Looks Resplendent in Her Sabyasachi Mukherjee Creation for Grah Shanti Puja – View Pics. As this great designer and a visionary celebrates his 20 long years, here's going back in time to witness some of his most famous artwork. 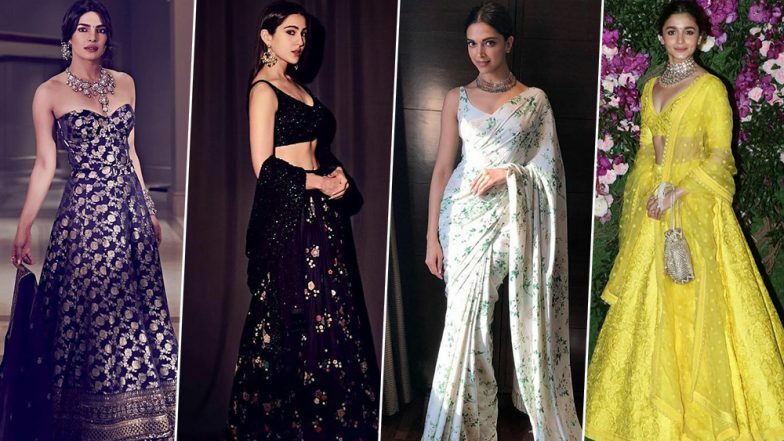 From Kangana Ranaut to Sara Ali Khan and Waheeda Rahman, his designs are apt for all age groups and there's no way you can stop falling in love with them. So go ahead and cheer for some of his best collections till date. There’s a Shade of Red for Every Indian Woman: Sabyasachi Mukherjee. It won't be wrong to say that he weaves magic with his designs. From elegant zardosi to thread embroidery, his job is tedious and he ensures his craftwork is never compromised. Known for his love for minute detailing, Sabyasachi is a brand in himself and one of most sought after designers these days. Here's congratulating him on this special day and wishing him loads of luck for the future.